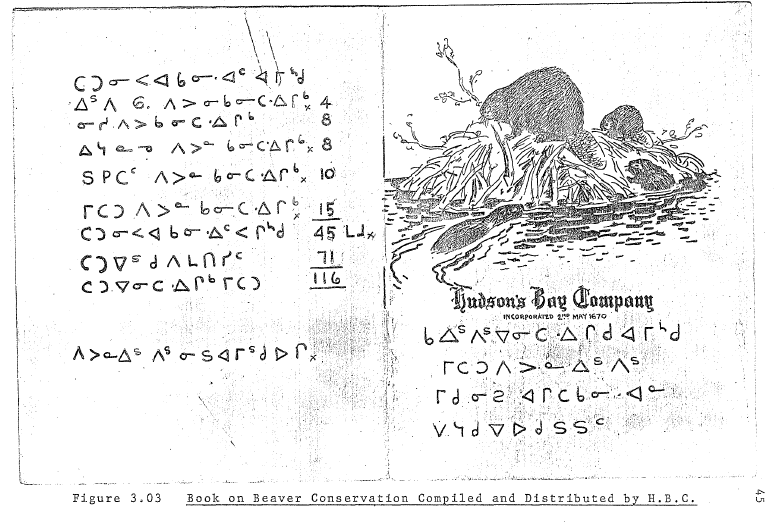 Screen shot of HBC document about beaver, from Murdoch thesis. Those who favour the use of syllabics over roman may appreciate the research and insights of John Murdoch, a Native speaker of Cree, who completed a Master of Education degree at the University of Manitoba in 1981. There are a lot of insights here far too valuable to be forgotten. John Murdoch, 1981. Syllabics: A Successful Educational Innovation. I have come across different narratives concerning the origins of Cree syllabics. If syllabics was extent prior to the incursion of European settlers, would there not be some manuscript evidence attesting to the fact? Perhaps there are writings of which I am not aware. Does anyone know of, e.g. petroglyphs, steles, etc. written in Cree syllabics? I’m told that there are surviving birchbark scrolls – such as those used by the Ojibwe Midewewin – that include syllabic characters. The astronomer Wilfred Buck also talks about seeing syllabics in the stars (like constellations) by looking through some perforated scrolls. But I also it’s not my job to tell Cree people what to believe! All that is written and said in comments are true. At age 12 I read about them in high school. At the time, I had no serious inclination to want to know about syllabics, nor to read and write with them. We grew up speaking Cree, everything was demonstrated in Cree and people left marks to indicate they had been at a place (somewhat what Inuit do with stone signs). As for the birch bark scrolls (supposedly 10,000 years old), it’s not open for discussion. Just like the Witiko doll which originates from Winisk and Hawley Lake made to keep away the spirit itself.